According to Comité Champagne Director of Communications Thibaut le Mailloux, 20% of the total vineyard surface area in Champagne is now under environmental certification. “Currently, 15% is under VDC certification, 2.5% under organic certification and 2.5% under other accredited schemes,” said Le Mailloux. The Viticulture Durable en Champagne (VDC) sustainability certification scheme was introduced by the Comité Champagne in 2014. “After 15 years of information and technical support to engage growers and houses in sustainable development, Comité Champagne gave new impetus for producers to achieve sustainability excellence based on a stringent and precise reference system adapted to the specificities of the Champagne denomination of origin (AOP),” said Le Mailloux. Since its introduction in 2014, several of the region’s Grande Marques have pursued certification, including Champagne Lanson. “The House of Champagne Lanson made a recent decision to invest in this still new process of sustainable viticulture in Champagne,” said Hervé Dantan, Lanson’s chef de cave. Champagne Bollinger is another key proponent of sustainability in the region. “In 2017, the benefits of sustainable viticulture were clearly demonstrated,” says Gilles Descotes, chef de cave at Champagne Bollinger. However, at least one influential grower has openly questioned whether VDC offers the same benefits as organic viticulture. “We don’t want to change to VDC certification as it won’t be an improvement, on the contrary, it is less stringent,” said Arthur Larmandier, of Champagne Larmandier-Bernier. Nevertheless, the Comité Champagne is clearly committed to addressing the challenges of climate change in the 21st century. 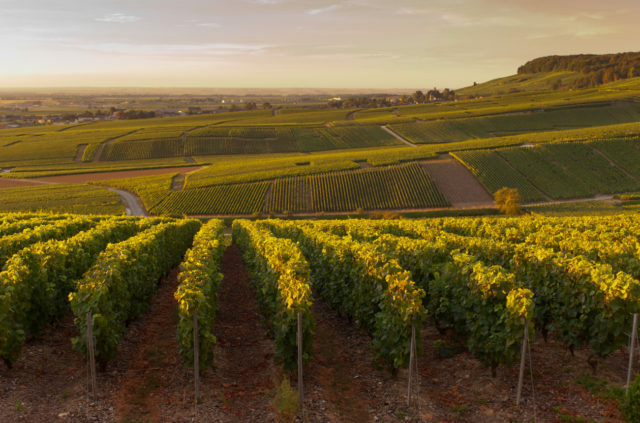 “To prepare vineyards for inevitable climate change, the Champagne region has developed its own varietal improving programme,” said Le Mailloux.